As the temperatures become more pleasant, we all look forward to enjoying more time outside. Adding the element of fire (fire pits) into your landscape design is a great way to add the finishing touch to your backyard design. Not to mention, research indicates that the crackling sounds and sights of fire create a relaxation response that’s linked to an evolutionary adaptation dating back to early man! 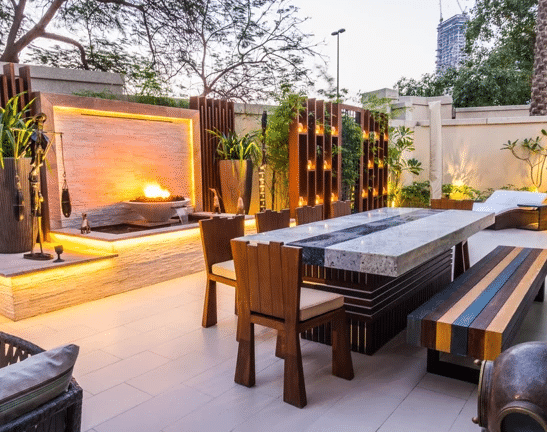 Whether you are dining under the stars or simply looking to relax with family and friends, fire pit design is ideal for taking your backyard to the next level. Outdoor fire features come in many styles and sizes, and with a little help from the experts at Milestone, we can create the perfect fire pit, fire pot or fireline to light up your backyard entertaining. Fire as a Feng Shui element is often used to enhance fame areas. 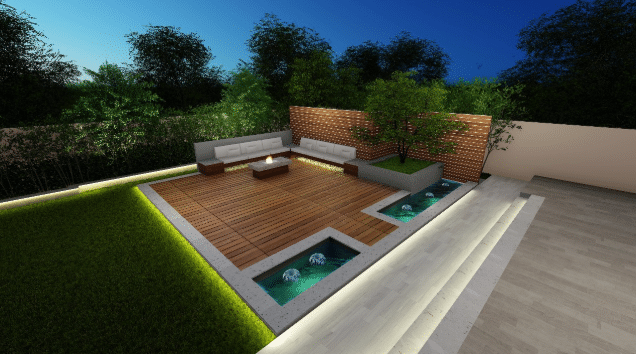 A modern outdoor firepit design works in any setting. A classic concrete or stone pit is designed to keep your fire contained safely while providing a focal point for entertaining. 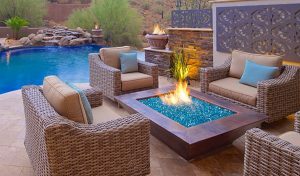 A ready-made fire pit with a table is also widely used. These are available in La Veranda Home&Garden in Dubai on Sheikh Zayed Road. This table acts as a fire pit when in use and otherwise can be used as a coffee table. 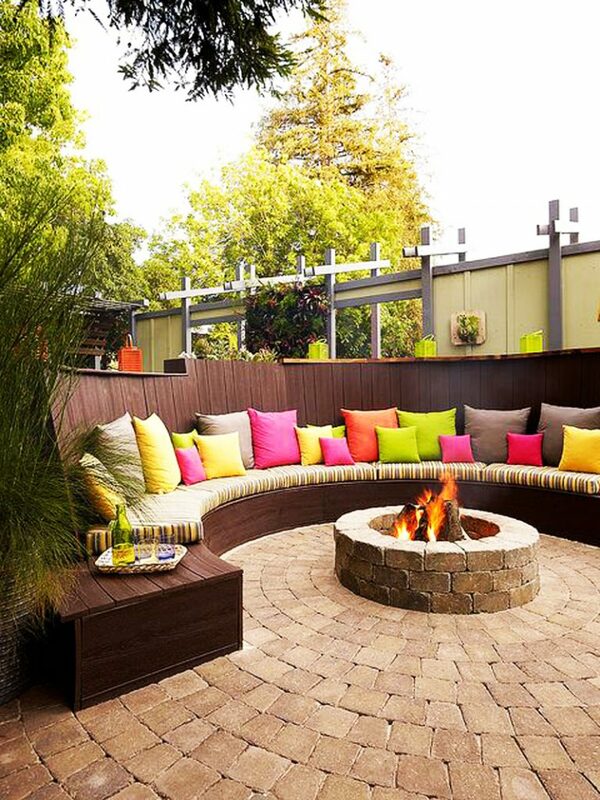 If possible, consider placing your fire pit design in a nook or corner of your backyard. Add the right furniture and a few small tables for guests to place their drinks, and you’ve created a beautiful little space for entertaining. Fire pits are often used in sunken seating areas or in the middle of the seating whilst you entertain. If you love to entertain in your backyard, creating a separate space for your firepit is a great way to keep things cozy and intimate. 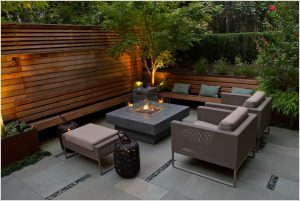 For example, a fire pit on a separate patio or under you pergola creates a space designed for relaxing around the fire. This space allows your guests to connect with one another in an area designated for relaxation and entertaining. When it comes to your fire pot or fire line design, get creative and think outside of the box. 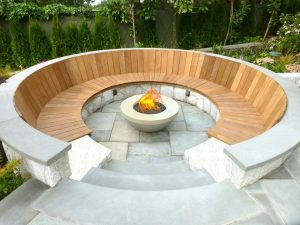 In fact, it’s not uncommon for an outdoor fire pit or firewall to be set into the ground. If your space allows it, consider creating a drop-down deck with a seating area around the fireplace. Here you can feature a traditional above-ground fire table, or design a unique fire pot directly in the ground. 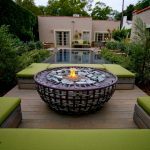 Typically, outdoor fire pit or fire line design focuses on creating a focal point around the fire table so that everyone feels like they’re part of the group. However, you may have an amazing view in your backyard. Not to fret, you can use your fire pot design to take your view to the next level of breath talking. 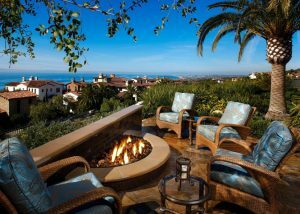 A semi-circle outdoor fireplace is perfect for highlighting a great view or skyline at dusk. With the right seating arrangement, guests can enjoy the entrancing flicker of the flames as the temperatures begin to dip after sunset. Again, try to think outside of the lanes of traditional fire pits. Instead, consider a fire line design that sits right into the floor of your sunken area. Just be sure to keep your seating area a safe distance from the open flames. 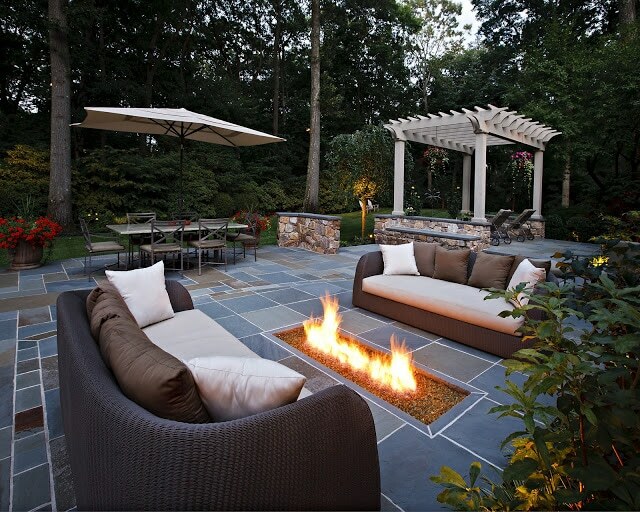 Having the firepit set directly into the ground is a creative idea and a unique way to add an intimate focal point to your space. 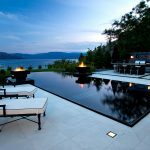 An outdoor fire feature is the perfect element to accent your pool. While most gas fire tables use gray or black rocks in their design, you can add beautiful blue rocks to balance the color of the pool water. Our design experts can also incorporate elements of water in the space where you design your fire feature. 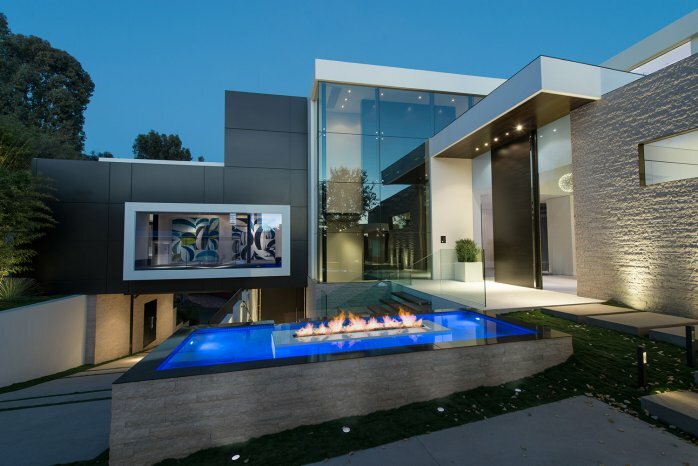 Whether it’s a lovely pond, custom water feature, or soothing water wall, combining the elements of fire and water create an amazing aesthetic. An outdoor fireplace doesn’t necessarily need to be the focal point of your backyard space. 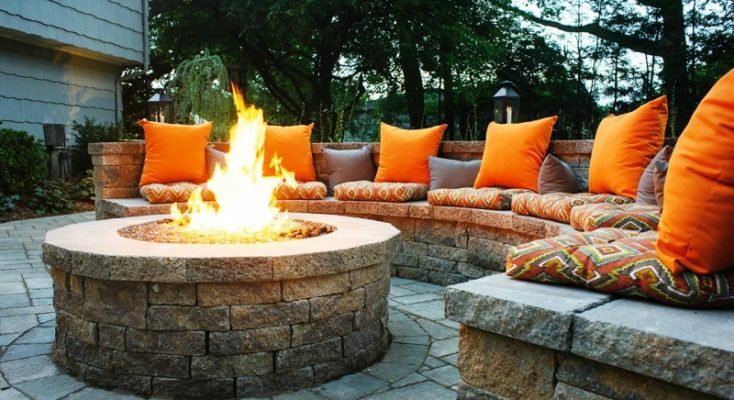 Rather than gathering around your firepit, consider a firewall in the backdrop. As the fire burns quietly, it will create a relaxing mood while simultaneously keeping the focus on family and friends. 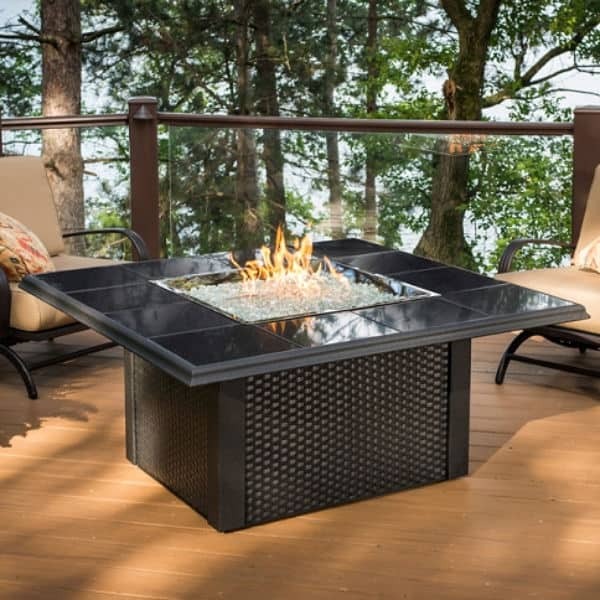 A sleek black planika fire pit, commonly referred to as a fire table, is sure to add a level of sophistication to your backyard. Crafted to contain the fire, the surrounding area also reflects the light from the fire, creating a stunning ambiance. A ready-made planika fire pot is a unique outdoor fire feature that is sure to lighten up your garden and landscape design. 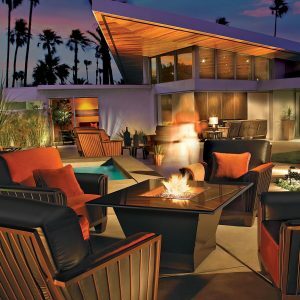 These modern fireplaces provide a unique element of fire to highlight your outdoor seating area to create the perfect space for outdoor entertaining. Regardless of the size of your backyard, a custom fire pit, fire line, or readymade planika fire pot is guaranteed to enhance your space, improve your entertaining area, and keep the conversation going after sundown. Here at Milestone, our design team wants you to feel comfortable in your home. We encourage you to visit our show villa or to contact a member of our team to schedule your free design consultation.